She can't get the awe-struck excitement off her face! Fall is here! YEA!!! Gosh do I ever love the fall! It's by far my fav season. I don't know what it is...maybe the crispness of the air, the trees turning, the thought of the holiday season nearing. Whatever it is...it's all greatness! Time to get out the long sleeves, sweaters, jackets and boots. Unfortunately, I don't think it will get just real chilly in Austin for a while but I still like to dress the part regardless of the temperature. 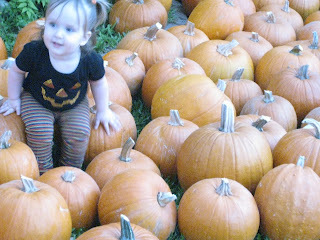 This month at Lola's school they are learning about pumpkins. So Lo has developed this new fascination with "pUm-kIns". I spell it like this b/c my writing can't quite express the way she says some of her words. She puts the emPHAsis on the wrong sylLAble. 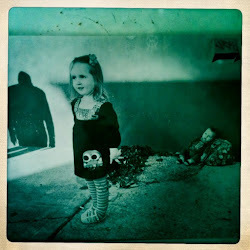 Of course, this is one of the many things that make the toddler stage so absolutely adorable. 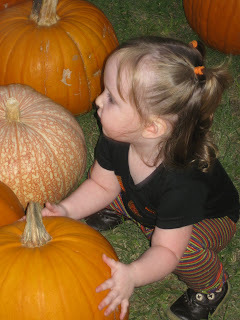 Anyway, back to the pUm-kIns....we thought since it's fall and Lo has been learning about pUm-kIns we would head to the pumpkin patch. When we got home yesterday, I told Lola as soon as she eats dinner and Daddy gets home we'll walk down to the pumpkin patch. Her eyes lit up like you've never seen and she shouted pUm-kIn pAtch!!! So we did just that, ate dinner and then waited anxiously outside for Clay to get home. Lola actually waited at the gate down by the driveway (she knows there is an invisible threshold there that she is not allowed to cross without an adult) in anticipation that Clay would arrive any second and we could walk down to the pUm-kIn pAtch. When Kristen pulled up she yelled "Kristen, Daddy home go to pUm-kIn pAtch". I don't think I'd ever heard so much excitement in her voice. Finally, Clay got home and it was time to head to the pumpkin patch. 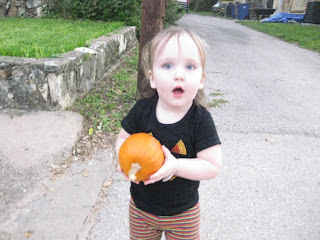 Well, this child obviously loves her some pUm-kIn pAtches b/c she went BERSERK!!! Basically, regardless of my writing skills (or lack of), there is no way I could ever express to you in writing the experience but it went a little something like this....Lo was frantically running around through the pumpkins shouting "pUm-kIn....pUm-kIn patch...Daddy, pUm-kIn....Mommy, pUm-kIn"...and on and on and on. I don't think I've ever seen her this excited about anything like this before. She didn't even take time out to take a breath. Then it got even better for Lo, the nice gentleman at the pumpkin patch gave her a sticker (which is another fav of hers right now) and this helped kick up the excitement level even more. Wasn't sure this was possible but apparently it was. At one point, our neighbor, Kevin, drove by and stopped for a sec. When Lola saw him, she sprinted to the sidewalk taking her little short steps, kicking her knees up as if she were in a school band, dramatically swinging her arms and she shouted "KEVIN, pUm-kIn pAtch" and pointed behind her as if he couldn't see the sea of orange pumpkins. Oh man...this child!!! I have to say...it was so great to see Lola this excited about something so simple...a pumpkin. A true memory that will stick with me for a long long long time! Luckily, the pumpkin patch is only 3 blocks from our house. We told Lola we would go back today if she wanted. We plan to buy some more pumpkins and decorate them this week. I'll have to catch this on video so you can truly understand what we witnessed....a VERY cute moment to say the very least!!! This moment reminded me of another very simple moment where Lola was ecstatic. When we were in South Padre, we went to Ihop. 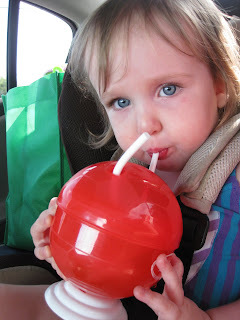 While we were there, we ordered Lola a "special" kids cup that cost us a whopping $1.99. I say this b/c I quickly found out this was the best $1.99 spent in a good while. She LOVED her "special" cup and called it a "cUpcake". We spent the whole trip talking about her cUpcake. She loved it! Here is a pic of her "cUpcake". We've actually had to tuck the cUpcake deep in a cabinet so we don't have to hear about it non-stop. She is just adorable! 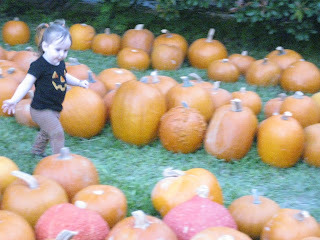 I love the picture of her skipping through the pumpkins! We're taking Carter on Friday so we're hoping for nice fall weather. We too love the fall! It's so nice to be outside and enjoying these perfect temperatures!